In the Wall Street Journal on Tuesday August 22, 2018 there was an interesting article that included the picture below (Fig 1) showing the S&P 500 Index on the verge of becoming the longest S&P 500 bull market ever. It has now lasted over 3,455 days, since the credit markets froze up and hit a low of 666 on March 9, 2009. Monday, the S&P 500 closed at 2862.96. 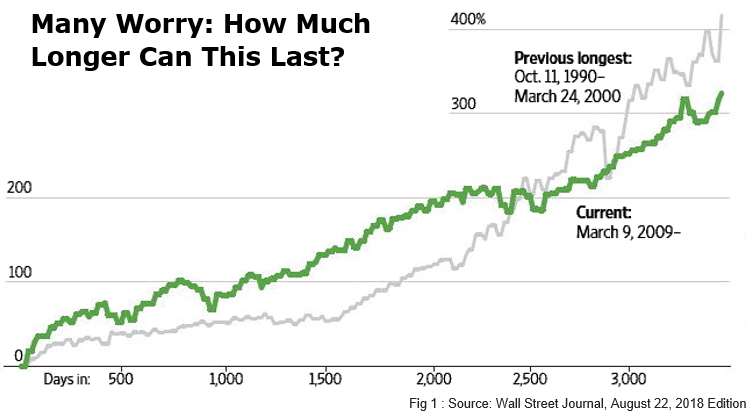 While many investors likely did not get in at the exact bottom (those where scary times), any capital that has remained broadly invested in equities has received a very attractive long- term gains with many investors earning 300-400% on their equity investments in this long running bull market. Many investors have asked us if they should they get out of the stock market? I believe if you are a long-term saver you should never get All-Out or All-In of a core holding. We can’t predict what the stock market will do tomorrow. Being out of the market typically involves much bigger loses of wealth as compared to the short-term paper losses that can occur in a correction. It also causes investors to miss out on large gains that occurred over short periods of time while they delay getting back in. Additionally, the transaction cost of trading, the market impact cost and taxes are often punitive to those that constantly get in and out. Nevertheless, now is a great time to reassess your cash needs over the next 5 years. If there is anything on the horizon that would affect your savings ability (e.g. losing a job, starting a business, retiring, buying a home, etc. ), having a little more defense (e.g. cash and bonds) in your investment portfolio will likely add to your confidence and make the next market decline look and feel more like a market opportunity and not a wealth destroyer. All past bull markets have come to an end at some point; we just don’t know when that will occur for the current bull market. The best time to rebalance and take some profit and reduce risk is when markets get out of balance and don’t match the risk characteristics needed to achieve your goals. Remember the market makes something cheap every day. Right now, the US Stock Market collectively would not be considered cheap by most measures; so, one strategy is to make sure your portfolio has plenty of the assets that have lagged the US Stock Market such as stocks of Foreign Companies in both Developed and Emerging Markets. 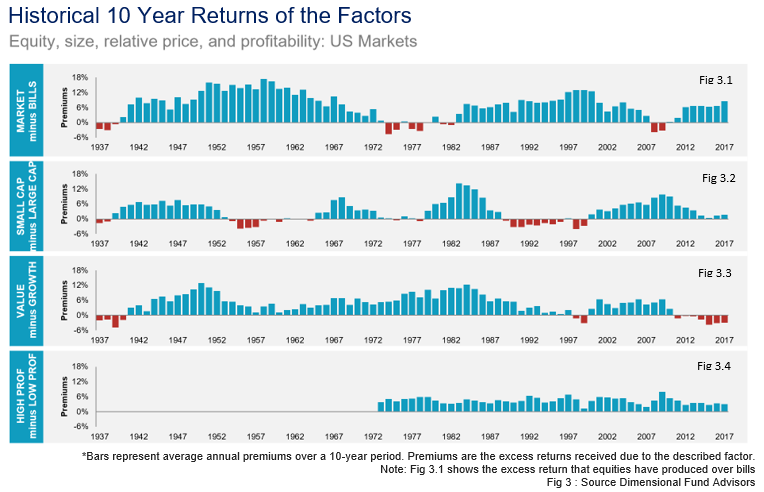 These out of favor areas generally have much more attractive long- term return prospects for the risk assumed. Investors that tilt portfolios toward “value stocks” (those trading at prices closer to their book values) have tended to produce a long-term average of 3-5% per year premium over growth stocks (those trading at higher price to book value ratios). Historically, these premiums show up about 80% of the time when looking at rolling 10-year time periods going back to 1927. However, in the last 10 years this premium has not been as strong in the US stock market, but very strong in the international stock markets (Fig 3.3). Therefore, diversification is such an important component of a long-term portfolio. Although we have no idea when these historical premiums will show up in market prices, we have a degree of confidence they will. Much research and analysis has shown that these factors are pervasive across markets and persistent across time periods. Investors that maintain exposure to these factors will be rewarded if and when the premiums materialize, which can change or appear on a dime. Thus, we recommend investors maintain long term exposure to these 3 factors because we believe doing so will lead to better long-term risk adjusted performance (premiums). Knowing and understanding the characteristics of your portfolio and the strategy you are using makes sticking with it much easier when the bear shows up to take back some of your gains. This last item, cost, is not well understood by many investors. It’s generally understood that explicit costs are stated in a funds expense ratio and the commission cost to buy or sell a stock or fund are easily found. However, hidden cost buried inside an investments trading and turnover are often much more damaging as these costs are harder to see and an easy place to charge consumers. These implicit costs of turnover can be 3x the typical expense ratio. These costs can have a significant impact on the performance of a fund. If you want a second set of eyes on your portfolio, your investing strategy or your entire financial plan, don’t hesitate to give us a call. We’d be happy to analyze your effective cost (both transparent and hidden costs that are buried inside an investments). We can also evaluate your exposure to the company size, value and profitability factors. Attractive portfolio returns are likely still available to long term investors. Now is the time to reassess your overall strategy and how you can profit in the future. Fig 1: Wursthorn, Michael, and Akane Otani. “Bull Market Set To Become Longest.” The Wall Street Journal, 21 Aug. 2018, pp. A1–A8. Fig 2: Wursthorn, Michael, and Akane Otani. “U.S. 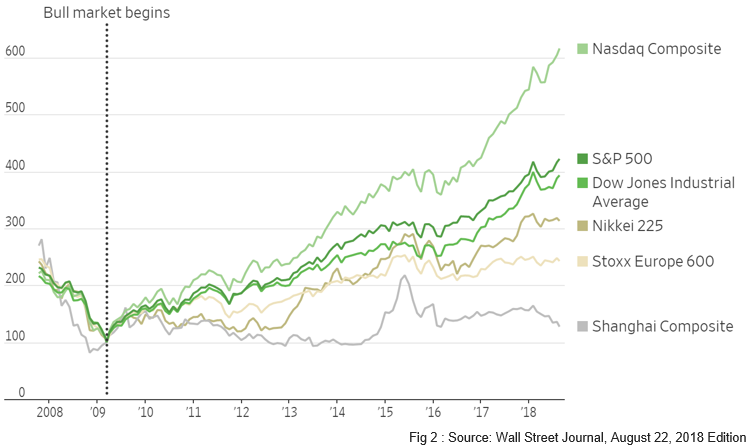 Stocks Poised to Enter Longest-Ever Bull Market.” The Wall Street Journal, 21 Aug. 2018, www.wsj.com/articles/u-s-stocks-poised-to-enter-longest-ever-bull-market-1534843800. In US dollars. US size premium: Dimensional US Small Cap Index minus S&P 500 Index. US relative price premium: Fama/French US Value Research Index minus Fama/French US Growth Research Index. US profitability premium: Dimensional US High Profitability Index minus Dimensional US Low Profitability Index. Dev. ex US size premium: Dimensional Intl. Small Cap Index minus MSCI World ex USA Index (gross div.). Dev. ex US relative price premium: Fama/French International Value Index minus Fama/French International Growth Index. Dev. ex US profitability premium: Dimensional International High Profitability Index minus Dimensional International Low Profitability Index. Emerging Markets size premium: Dimensional Emerging Markets Small Cap Index minus MSCI Emerging Markets Index (gross div.). Emerging Markets relative price premium: Fama/French Emerging Markets Value Index minus Fama/French Emerging Markets Growth Index. Emerging Markets profitability premium: Dimensional Emerging Markets High Profitability Index minus Dimensional Emerging Markets Low Profitability Index. Profitability is measured as operating income before depreciation and amortization minus interest expense scaled by book. S&P data copyright 2018 S&P Dow Jones Indices LLC, a division of S&P Global. All rights reserved. MSCI data © MSCI 2018, all rights reserved. Indices are not available for direct investment. Their performance does not reflect the expenses associated with the management of an actual portfolio. Past performance is not a guarantee of future results. Index returns are not representative of actual portfolios and do not reflect costs and fees associated with an actual investment. Actual returns may be lower. See “Index Descriptions” for descriptions of Dimensional and Fama/French index data. Eugene Fama and Ken French are members of the Board of Directors of the general partner of, and provide consulting services to, Dimensional Fund Advisors LP.